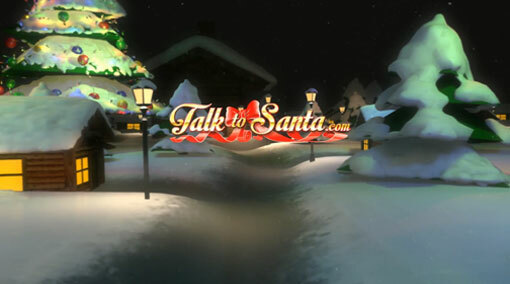 Talk to Santa Live at the North Pole! 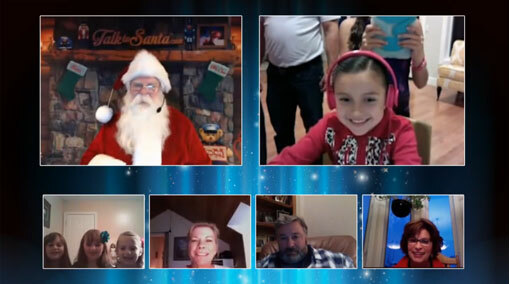 Family and friends from different locations anywhere in the world can join you and Santa to create lasting memories. A live video chat is a magical experience children will remember for ever. You can share your video on Facebook, Twitter, Google+, email and more. A personalized video from Santa is a great present for classrooms too! Santa will record a personalized video for your family, friends, co-workers, classroom and more. A personalized recorded video from Santa is a gift for a lifetime. Why send a Christmas card when you can send a personalized video from Santa? "santa was very nice and sweet and i hope i get to see him again and i will leave cookies and a snack for the reindeer and Santa MERRY CHRISTMAS everybody and santa"
"Santa was great and made all of us smile." "i cant believe he knows alot about me"
"Once again the Santa experience was great!" "Thank you for the magical experience!" "Kids really enjoyed the video call. Look forward to doing it again." "magical, thank you so much, what a personable special santa x x x merry xmas all x"
"Olivia says, 'it was very cool and i don't know how he knew everything but it was awesome!' Logan says,' i don't know how Santa knew everything. It was very very fun. We love you Santa." "This was a great experience. Gavin and Declan loved talking with Santa. Thank You"
"Santa made a wonderful Christmas for our children. We were unable to visit him as they were sick and now they are soooo excited@"
"this was a GREAT CALL!! SANTA WAS AMAZING!!!!!!" "It was a great experience for our grandchildren"
"Hope to talk to you again next year! Have a merry christmas Santa!" "always a pleasure to speak to Santa. Thank you!!" "Alexis says thank you so much and Merry Christmas!!" "Went very well. Even made the 4 year old take notice!" "great job and easy to use"
"Dear Santa, I wonder if you can send another elf to watch me? Love you santa. Mom and Dad said it is ok if you call them Bill and Alicia. From Nolan"
"Dear Santa, I know we just talked I want to say one more thing..Christmas is awesome! I love Christmas and when the reindeer get tired please give them a break. I wish you a merry Christmas Santa"
"i love santa and christmas is my favorite holiday we will leave carrots for dasher, dancer, prancer, vixen, comid, cupid, doner and blitzen and rudolph thank you so much for all you do every year and this year i will make santa a homemade gift for hi"
"he was great... quality time with the kids..."
"Santa was great, the kids loved talking to him!" "this was our 3rd year, and it was amazing as always!" "Wonderful!!!!!!!!!!!!!!!!!!!!!!!! Kids are over the moon happy. Thank you, the best purchase ever!" "i love the joy he brings to us"
"He did good with our very little ones and kept it going. Thanks, Santa!" "This was the best thing I could have ever done for my son!!! It was AMAZING! Santa was awesome!!!!" "We also have a stocking for Santa and Mrs. Claus. We love you and fly safe. Tell Rudolph Hello!" "i loved him on so many levels i cant explain. <3"
"Year 2, and still love it.. thanks"
"This was amazing!!!! The boys LOVED this magical call with Santa. He spent a good amount of time talking to them, and was jovial and so great! I can't thank you enough - thank you so much!!!!!! We are looking forward to next year!!!!" 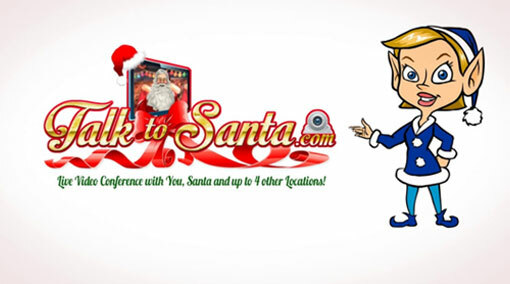 "Great Experience, Glad Santa had time to talk to us... know he is really busy!" "My son was so excited and happy to see and talk to Santa. Thank you for making his Christmas so special"
"olivia says thank you and santa is the best"
"Joey(7) Jude(5) "I can't believe, well I DO believe, I saw Santa and I about passed out! "He made my CHristmas so great! Thanks Santa & Elf Mike (for all your IT help) xoxoxo"
"Santa made us all laugh, He was really nice. We hope to talk to him again in the future!" "Santa was awesome!!! Thank u so much"
"Wonderful, my son's face made me so happy, thank you!!" "Thank you ! You are making a lot of children happy. Merry Christmas." "Was absolutely amazing!! got to see her smle!" "thanks santa you made our day"
"Thank you for having this program its soo cool!!" "I will be a part of the video chat as long as my niece and nephew love it." "AWESOME job Santa Thank you. The kids are still talking about it and laughing. They are soooo happy." "Best Santa experience ever! So well done. Thank you." "This is the best thing ever. Our second year participating and I'm so happy with our experiences. Thank you. This makes my kids (and me) smile. Merry Christmas!" "Thank you so much its just setting in for Dominic and he is so excited he got to speak with Santa." "very professional and daughter really enjoyed it thank you"
"Amazing experience! Merry Christmas everyone!" "Thank you for your time. Thank you for everything that you did for me and A Very Merry Christmas. I will continue being good. Wish I was there with you in the snow. ps: Love your beard. Love from Bannon and Mommy (Celina) in Coventry, England CV"
"Thank you! It was AWESOME!! The kids loved it"
"thank you and merry christmas from Annika and her family." "you are so awesome i will always belive i loved talking to you! love ,Carsyn." "Santa was great, we all really enjoyed speaking to him." "Thank you Santa!! Have a Merry Christmas and we can't wait until you come. We will talk again next year!!!" "We thought it was AWSOME!" "Brought a tear to my eye and created a forever-memory in my heart. Thank you so much Santa!" "thank you! merry christmas santa!" "It was great! Thank you Santa!" "Easy enough to use and this was our second year and we will be back." "This is our tradition now. We greatly appreciate it." "it was fun seeing Santa!" "This was a fantastically magical experience for the kiddos! Thank you, Santa!" "Love it! Every year we love talking to him!" "Am I on the good list?" "This was great! Thank you so much! He made things so believable! The kids were stunned! Awesome, thank you, thank you! Would recommend this to anyone!" "Santa was fantastic and very patient !!!" "Such a great Santa! She is amazed." "We loved talking to Santa! Great fun, Thank You!!" "Thanks for the great chat! Santa handled the "is Criddle the elf a toy?" question really well. Merry Christmas"
"it was a wonderful experience for Danton. Thank you Santa!!!" "This is an excellent experience my little boy is so excited." "Terrific and magical even if my child is shy and a bit in awe. : )"
"This was amazing! We loved Santa." "thank you so much for your time and effort to make this video! :)"
Live Reindeer Cam Watch the Elves Feed The Reindeer -Live! Mrs. Claus Webpage See what Santa’s wife is doing! Watch and Share Christmas Stories! We are proud sponsors of Toys For Tots. 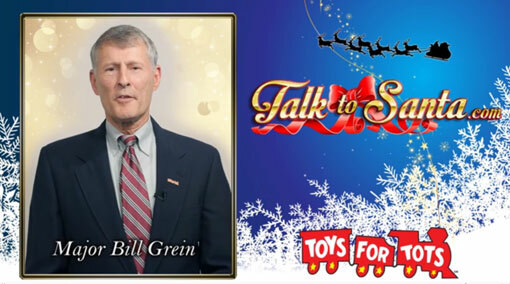 For each call made to Santa Claus, we donate 10% of the gross revenue to the Toys For Tots program. If you would like to help less fortunate children. Click the link below.